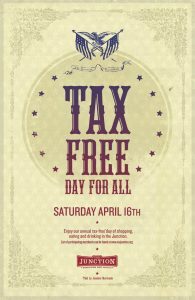 Tax Free Day in The Junction Saturday April 16th! Capers – Last chance SALE on blockprinted linens. Quilts now $49.99. Placemats now 4/$9.99. Show this ad and save 20% off non-sale item of your choice. City Mouse Studio & Store – Take an additional 25% off all SkipHop products. Clementine – All Melissa brand shoes will be $20 at Clementine. Curious Kidstuff – 25% off any purchases over $100. No gift wrap. Dream Dinners – Coupon code for 10% off is DDANY201110. Not valid with any other promotion or offer. Garlic Jim’s Pizza – ANY Large Pizza & Pitcher of Beer or Soda for $20. Jan’s Beauty Supply – Take an additional 15% off all liter bottles of salon brand shampoo and conditioner. JF Henry – 20-40% off ceramic bake ware – including Le Creuset. Knows Perfume – 50 to 70% off select items. Sound Advice – 25% off all cell accessories in stock. The Beer Junction – Free Pint Glass with any $30 purchase! Wild Rose’s – 20% off all jewelry.